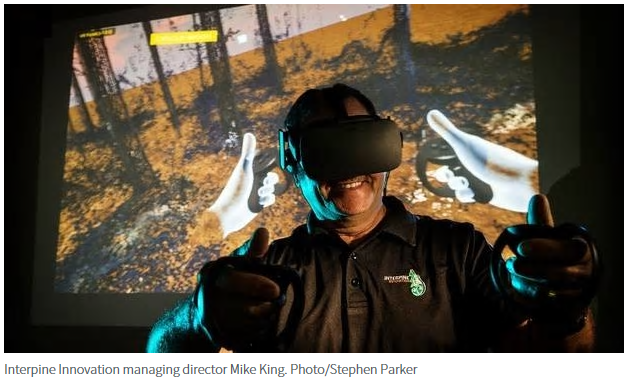 The forestry industry has been experimenting with virtual reality in Rotorua this week to develop new ways of measuring tree growth. The University of Tasmania and Interpine are carrying out the research, which is partially funded by Forest and Wood Products Australia. The University’s Human Interface Technology Lab leader, Dr Winyu Chinthammit, said the experiments aimed to give skilled workers a safer and more efficient way to measure forests, using data from aerial LiDar scanners, rather than field work. “The original project started last year … To see whether humans can actually visualise and perceive that as a real forest and perform tasks they would normally do.” Interpine LiDAR specialist Susana Gonzalez said feedback from experiments this week would help improve the software before the next experiments in February. “The target is to be able to assess plots in the office in one year’s time.” Interpine operations manager Bruce Hill said the technology would help avoid health and safety risks. Thirty-four participants are testing out the virtual reality method this week, including representatives from NZ Forest Managers and Timberlands. The annual Rotorua GDP for forestry and logging for the year ended March 2016 was $199.5 million, up from $166.7m the year before, according to the Ministry of Business, Innovation and Employment’s latest figures.